← Rejuvenating solar garden lights — with nail polish! This past weekend E and I went out to the Berkshires to visit some longtime friends. 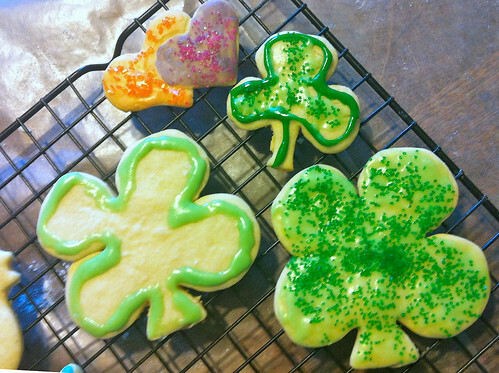 Since St. Patrick’s Day fell on Saturday, E suggested that we all make St. Patrick’s Day cookies, and decorate them. 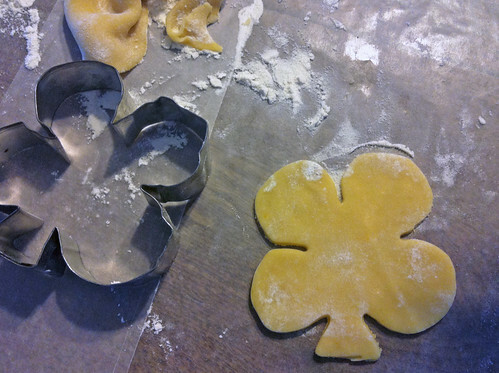 While the dough was being assembled, we started looking through the house cookie cutter collection for shamrocks or four-leaf clovers, but no luck. 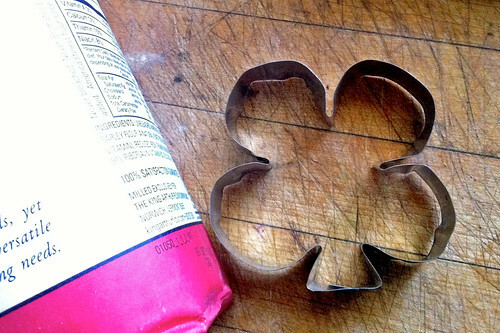 There were all kinds of other shapes, though, and twenty minutes and a pair of needle-nose pliers later, I had remixed one small cookie cutter into a shamrock, and one large cookie cutter into a four-leaf clover. Looking good (enough! ), we baked and then decorated the cookies. The shamrock was a little bit on the small side, but the four-leaf clover came out respectably well! So What Did We Learn? We learned that metal cookie cutters can remixed and remade into new shapes. We learned that the best overall shape for a cookie is “blob”, and that “blob with minor details” is the second best shape. Fine detail doesn’t work, and remember: you’re not making stamps that will be inked and pressed onto paper: spindly tendrils of design – skinny peninsulas- don’t work. Filigree is right out. If you’re going to make a new shape out of an old one, pick an old one with roughly the same length perimeter. Small old cookie cutters make for (too) small new cookie shapes. When you start with an old cookie cutter, bend it out into a flat circle first, then work into the desired target shape. Cookies are dangerously tasty. So now you get to add tinker to your resume?